For over a year now we have been organising investment days at Visuality. At first we called them Hackathons, but soon we realised the naming was all wrong. What is the main idea of investment day? Learning. You can actually do everything you can, but first you need to answer two simple questions. Is it possible to do it in one day? Will it improve my skills and bring something good for Visuality? If answer to both of them is yes - you have a green light:) Very often an investment day results in learning new technologies/frameworks (React.JS, Elixir) but sometimes we create some great open source projects. 5 open-source projects we've done recently. Juggler can be used by any team that does code reviews in production process. It's not complicated and can be easy adopted for any team that has development process dynamic to keep all the reviewing up to date. 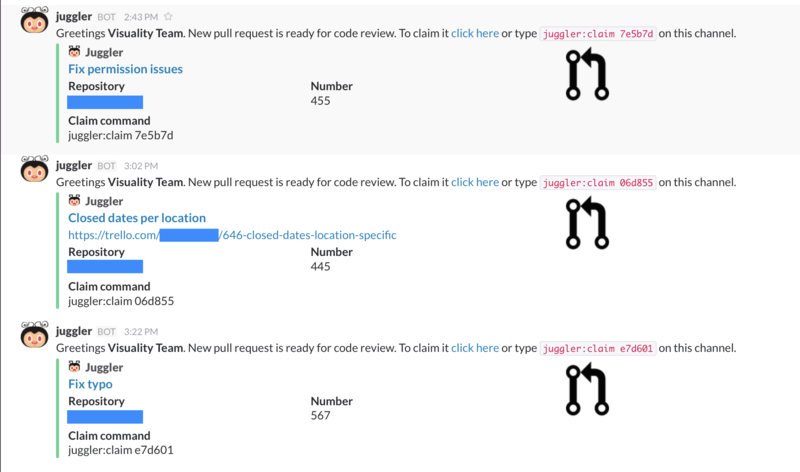 Juggler monitors pull requests and post every one of them on dedicated Slack channel for code review. Idea is to have any team member volountary review posted piece. If no one is eager to review it juggler chooses team member to do it. This is very cool tool for keeping workflow fluent and have the quality of the code on the appriopriate level. This cool gem solves specific challenge regarding sending text messages via SMS e.g. password reset or retrieval. The use of this gem is super useful when one wants to implement easy way for using mobile txt messaging. It was made for the product development purposes, but can surely be used in wider range. There is a funny story connected to this gem - at FrontTrends conference a guy from Twilio asked me if We created this gem because it is fantastic;) So we are actually sure we did a great job there. 3. web-connected-relay - update to Sesame Project. We are using Particle Photon relay as a replacement for Raspberry Pi project made earlier for door opening. Since our office is placed in house and sometime it is too far (or we are too busy ;) ) to go to the door and open it by our own we done relay to open doors for us / or even change the Xmas lights outside. For sending "open" or "change lights" request to the device we simply use our helper dog bot via Slack channel #general. All right, we are never too busy for guests in our office. :) This project is one of many we are doing on the relay and surely will add our share to Internet of Things. Blog Post Link - this one is the Raspberry Pi project post. We are great fans of old Warsaw and tracking the changes that city goes through within years. The idea here is to provide picture history of interesting (or whatever), spots on the city map. It uses Google Map view and can easily be adopted to any other location and purpose where the idea has sense of using it (mainly picture history record). Project is still under development, but You can test it under this link. 5. Neko - cat bot for Slack. Neko is chat bot that does a lot of things for the team. 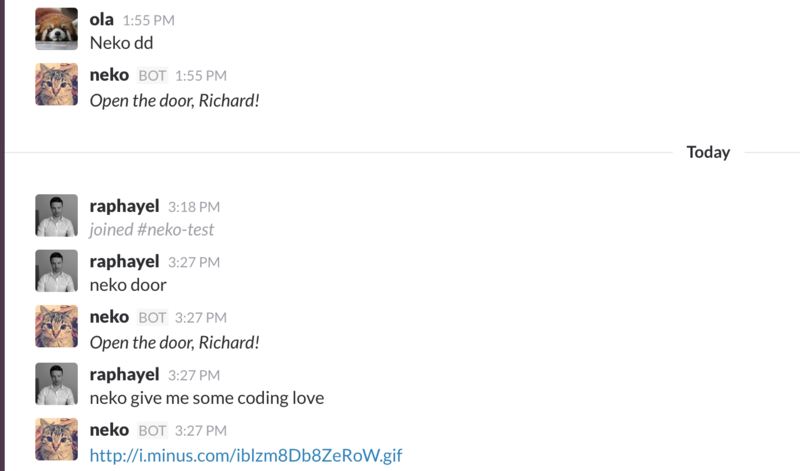 Connected to our Team's Slack it sends us funny pictures from Coding Love and open doors via Particle Photon Relay. It even signs songs. The idea is build on hubot and adopted to our purposes. For next editions we are preparing ourselves for Elixir project, clever MacBook Pro case, dating game development and some other cool and serious ones we have on our list. For small projects which do not have CI integration, RSpec tests can be run just before deployment.